*Glutathione is a powerful antioxidant enzyme that we make in every cell in our body and is a significant component of our antioxidant defence system. High concentrations are produced in the liver where it plays a central role in ridding the body of harmful pollutants and protecting the tissues and cells from free radical damage. Despite being a very small protein made up of three key amino acids lysine, cysteine and glutamine, Glutathione is a highly potent antioxidant and is therefore vital for health. It is amongst the most efficient substances used by cells and tissues throughout the body in their defence against oxidative stress. For this reason it is often referred to as the ‘Master Detoxifier’. It is particularly active in tissues that are most susceptible to toxicity such as the brain, kidneys, liver, heart, lungs, skin and eyes. Scientists agree that Glutathione status within the cells is a very good indicator of the cells overall health and its ability to fight toxins. Without glutathione, red cells die, white cells can’t function effectively and nerve tissue degenerates. Scientific experts agree that Glutathione is one of the primary protective compounds in the body. Theoretically supplementing with Glutathione may help to maintain antioxidant defences to combat various diseases; however it is subject to a number of gastrointestinal obstacles which may hinder its absorption. Standard Glutathione tablets or capsules can’t withstand the digestive processes in the body. The Glutathione is quickly broken down into its 3 constituent parts - cysteine, glycine and glutamine. These amino acids are sometimes needed to produce other substances in the body and so Glutathione doesn’t always reach the cells intact. Until recently intravenous delivery of Glutathione has proven to be the most effective route for absorption, but this method of delivery is both costly and impractical. 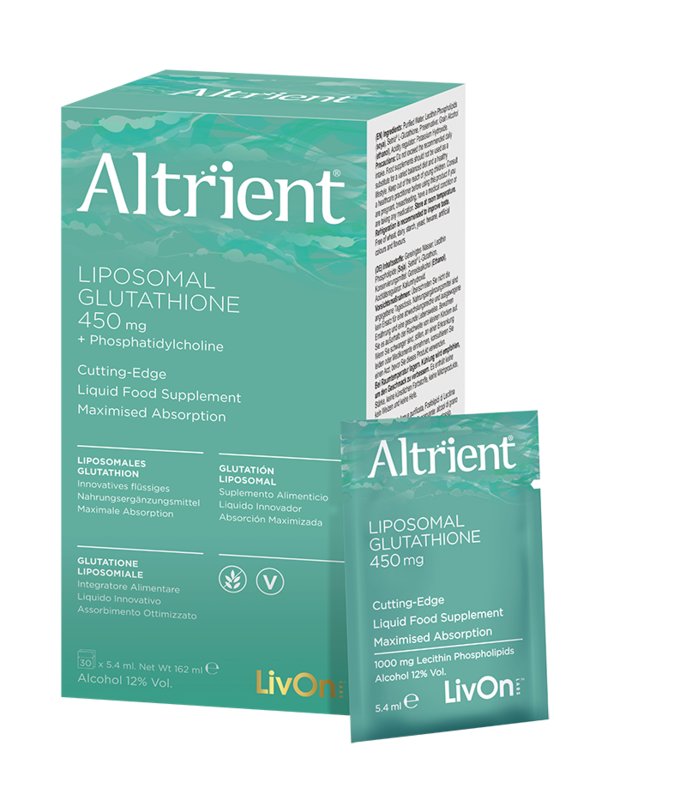 However Liposomal Glutathione allows you to take Glutathione orally ensuring it reaches the cells where it is needed most. Liposomal technology is able to increase the absorption of nutrients by capturing the active ingredients inside protective membranes called liposomes. These tiny liposomal bubbles consist of bi-layers of phospholipid molecules (similar to your own body’s cell membranes), that protect the contents and manage to by-pass the digestive juices to deliver the Glutathione directly to the cells. This unique method of delivery protects the Glutathione from oxidation and degradation avoiding gastro-intestinal distress and ensures almost 100% bioavailability.